Health care providers are naturally inclined to act as problem solvers, provide advice and argue for positive change. They often overestimate or ignore patients' degree of motivation to change. For patients who are not ready to change, this approach is often counterproductive, resulting in silence, anger or avoidance. As a result, health care providers may avoid the issue of substance use or push patients harder to try to stimulate change. These approaches tend to diminish motivation. Assessing a patient's readiness to change is the best way to minimize frustration and improve the chances that change will happen. Interventions that are appropriate to the patient's stage of change can increase motivation and promote positive change. The stages of change is a model of the behavioural change process. It helps people to understand that change takes place incrementally, and that changes in a person's thoughts often take place before changes in action. 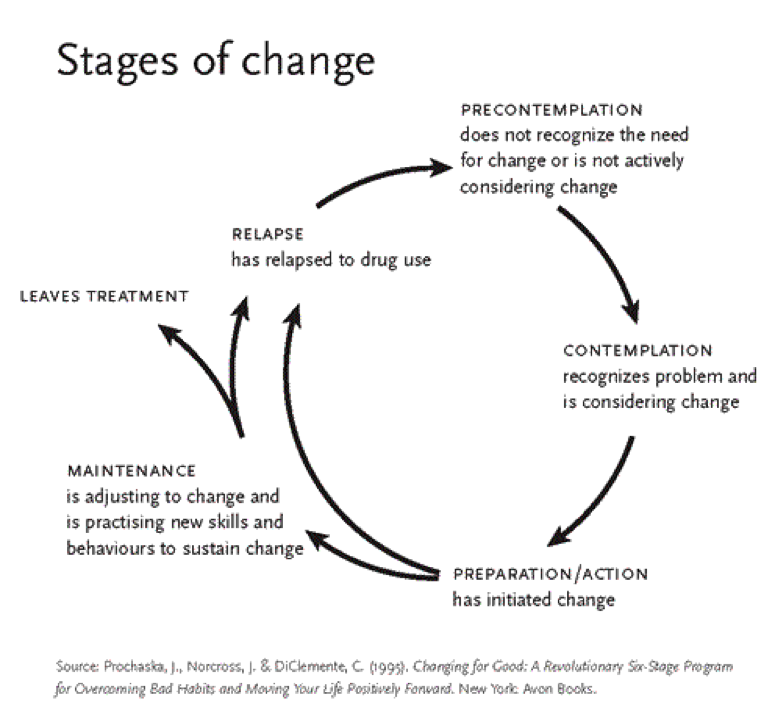 Breaking down change into a series of stages often makes it easier to intervene appropriately. 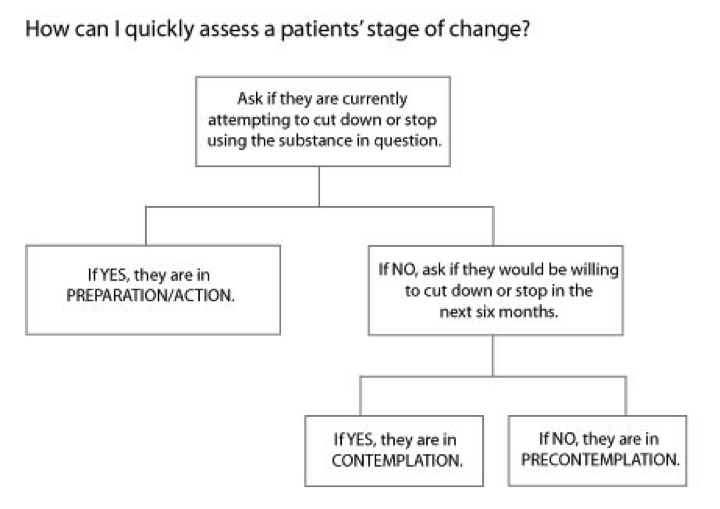 A simple and quick way to assess a patient's current stage of change is to ask about their intention to cut down or stop substance use in the near future. Provide brief advice about the importance of cutting down or stopping substance use, and tell the patient that if they are ever interested, you would be willing to help. Ask whether the patient would be interested in more information about treatment approaches, or what it would take for the patient to be willing to cut down or stop the substance use. Provide encouragement, offer assistance and, if necessary, refer the patient for addiction treatment. Attempt to engage patients in a discussion about their problematic substance use. Simply asking patients how they feel about their substance use, or if they have ever considered cutting down, encourages them to talk, even if they are not ready to make changes. The important thing is to begin a conversation that is non-judgmental and avoids pressure. "Why do you think you should you cut down or stop?" Explore the importance for patients of cutting down or stopping. Encourage them to weigh competing values, benefits, priorities and perceptions of risk. "Do you feel that you are going to be able to cut down or stop?" Explore patients' confidence in their ability to cut down or stop. This includes issues of self-efficacy, past experiences and alternative solutions. "When do you think you will be ready to cut down or stop?" Explore patients' readiness to cut down or stop in the near future. Allow them to weigh the competing priorities in their lives with their own assessment of their confidence. In general, the more important the issue is to the patient, and the more confident the patient is about succeeding, the more likely it is that they will be ready to commit to making a change – they will be more motivated. Some degree of ambivalence about the importance of making changes, about one's confidence in being able to change and about one's readiness to makes changes is inevitable. Ambivalence is generally lowest when the patient is not at all interested in changing (precontemplation), or is clearly ready to make changes (action). It is during the process of considering change – of moving from low motivation to high motivation – that the patient naturally experiences a rise in ambivalence. The contemplation stage is where ambivalence peaks. It is characterized by the phrases "I want to, and I don't want to" or "I know how, and I don't know how." Patients who are ambivalent are those most in need of counselling. Signs of resistance to change include "yes, but . . ." statements, outright anger, not showing up or simply forgetting. When patients are resistant, it means they are not ready or the process is moving too quickly. Slow down or back off. "It sounds as though you feel we're moving too fast. Perhaps you're not ready to cut down at the moment." Increase intrinsic motivation by reinforcing the patient's ideas and feelings about his or her own goals and personal values. "I know this must seem like a big step for you, but I remember you telling me that breaking this habit is the most important thing you can do for yourself." Provide education to the patient with the aim of eliciting a response. "Did you know that if you quit smoking now, it would have a dramatic effect on your ability to breathe over the next few years?". This approach is often more effective than information that is meant to scare the patient or to support your own perspective (e.g., "If you don't quit, you're going to die"). Express empathy: In all forms of counselling, empathic listening is essential to building trust, which in turn opens up possibilities for change. Develop discrepancy: In general, change is motivated by a discrepancy between a person's current behaviour and important personal goals, beliefs and values. Drawing attention to these discrepancies and encouraging "change talk" may help to resolve or reduce a patient's ambivalence. Roll with resistance: Avoid arguing for change and other forms of "resistance talk" because it tends to reduce motivation to change. Support self-confidence: Small successes and emotional support can increase a patient's confidence (the patient is responsible for choosing and carrying out change). Be curious: While there are many types of questions that can be used to propel a conversation that increases motivation, the most important characteristic of the primary care provider is a genuine curiosity about what motivates and what inhibits the patient's path to change. Provide a decisional balance sheet to help patients reflect on the relative merits and drawbacks of making the proposed change (e.g., "What are the pros and cons of continuing to smoke?"). Ask open-ended questions that evoke change talk (e.g., "What worries you about your current drug use?"). Use scaling questions to assess motivation and to help set small goals (e.g., "What would it take to increase your confidence to quit smoking from a 2 to a 3 out of 10?"). Reflect back and elaborate on small goals (e.g., "You say you are interested in changing your drinking habits someday. Is there anything you could do now that would be a start in that direction?"). Provide information and elicit a response (e.g., "Drinking more than two to three drinks per day is often a cause of high blood pressure. What do you think about your own drinking pattern?"). Back off to reduce resistance (e.g., "It sounds as though you're not really interested in getting help at the moment"). With the techniques listed here, aim to resolve ambivalence to the point where the patient feels ready to make a change that is congruent with established goals. "It sounds as though you're ready to give up the drug you've been taking. Would you be interested in starting to talk about this?" When the patient indicates a willingness to try, the process of increasing motivation shifts to negotiating a change plan.